For 364 days in a year, these metalheads bide their time, sniggering at every acoustic folk singer-songwriter and every electro-experimental ambient side project and every reggae-funk-jazz DJ concoction that the city of Bombay will inevitably worship as the newest in-thing. But they wait, complaining sporadically about the lack of venues here, but mostly keeping to themselves (possibly because no one else talks to them). 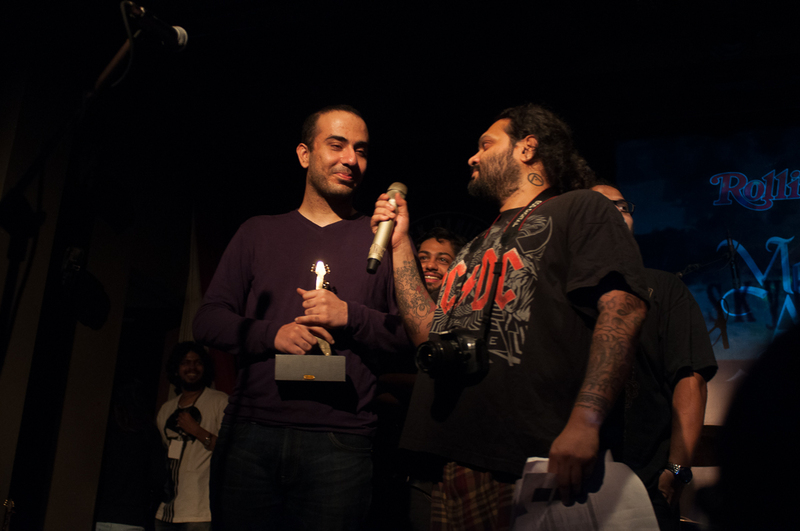 Then the Rolling Stone Metal Awards thing happens, and they all flock to Blue Frog in their massive combat boots and indulge in copious overuse of the f-word and headbang their asses off. And they mosh. And they growl and play really fast guitar solos and stuff. It sounds horrifying but it really isn’t. Quite the opposite, actually. And while I’m not much for metal, I do enjoy the occasional gig. So I put on my black T-shirt with the squiggly lines and all the blood and then I put on my black nailpaint using only the E minor pentatonic at 180 BPM, and then I went for the metal awards. Entry was Rs. 250, and I walked in on P-Man hosting the evening yet again. I’ve written about his brand of hit-and-miss comedy before since he’s usually compering these events, but on this night, he was mostly hit and very little miss. There was a lot of “Metal horns up, motherfuckers” and reading of lengthy band biographies from their Facebook pages but nothing especially jarring or annoying. In fact, it was just one of those evenings where everything sort of falls into place, collectively. From Scribe playing a whole bunch of new songs and introducing a new second vocalist (a man whose name I believe is Chudail, based on what the vocalist was saying), to an incredibly powerful set by Devoid, who managed to maintain an outrageously high level of power and energy throughout. The awards were breezy and the people just did their thing and walked off, from the presenters to P-Man to the artists receiving the awards. Scribe were the last band to perform, and while it was getting late, the place actually seemed to fill up more than before when they took the stage. Scribe have obviously transcended the whole ‘rock-band’ thing, and their gigs are as much about the performance art aspect as the actual songs. So the vocalist, the bearded one in the glasses who kept doing that absurd staccato dance, ended up spending a lot of time talking to the crowd and just being outright hilarious. Most of the little jokes and tidbits were in Hindi, most of them laced in profanity, so they don’t quite translate over here. At one point, he got all the girls (yes, there were lots of girls there!) in the crowd to gather in the centre and warned the guys to behave. The band then covered a Justin Timberlake song, and there was not a soul in the crowd, dreadlocks and hairy legs and all, that didn’t bop along to it. It was all quite surreal. The crowd was really very responsive, although they did fall flat when the Devoid vocalist asked them if they were “good and sozzled”, largely because not many of them knew what sozzled meant (this isn’t a dig; it actually happened). Coming back to Scribe, the thing with their set was that while the jokes and the banter and the chitchat was hugely entertaining, they aren’t Alien Chutney. The gimmickry is pretty much built into the core of the band and they like to have fun while doing what they evidently love. But then, they’re Scribe – they write really good songs and a whole lot of them. There’s not a weak spot in that band, and their drummer is left-handed, which automatically makes him a real favourite of mine. But they wear three-piece suits and Spiderman masks and they talk about Mogambo and Teja and campy Hindi movies. So, even though their set lasted longer than an hour, it still felt far too short. I wanted to hear more music, more Scribe songs. But then again, if their vocalist had a back pocket in his shorts, then that’s where the entire crowd was safely tucked in by the end of the night. The violent mosh-pits, the smattered blood, and the multiple stage dives are testament to that. 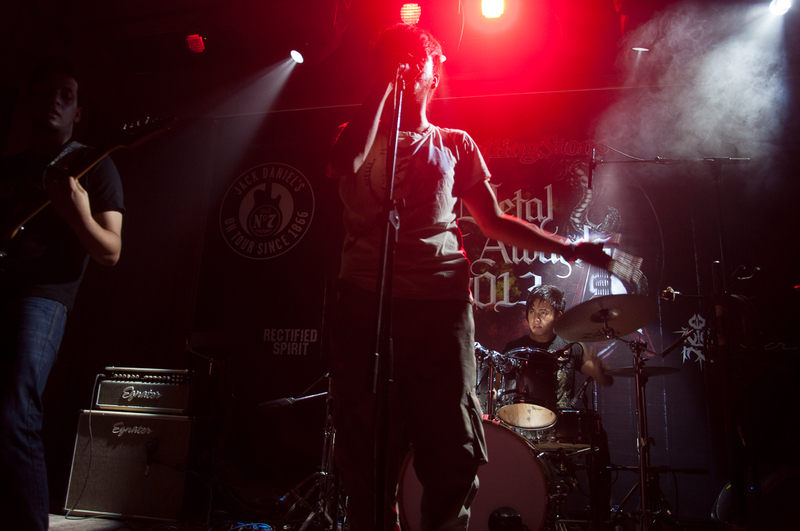 As for the other bands, Rectified Spirit, from Guwahati, kicked off the evening. They had a song called ‘Rectified Spirit’, which got a little meta for me. They weren’t exactly spot on, and the crowd was still just getting settled in, so the set was a little underwhelming, but the theatrics and the operatic range the vocalist displayed were often awe-inspiring and, this may be my limited understanding of the genre, but some of the vocal flourishes reminded me of this really cool, really weird band called Giant Squid. Rectified Spirit in their elements. Devoid played an exacting set and it was a pleasure to see a band in such fine form, with not a misplaced note or growl all evening, even if the music wasn’t exactly my cup of tea. And India’s very own black metal band, 1833 AD, played too. They seem to take themselves a little too seriously and I’m really not a fan of the music as such, but they got the crowd going and fair play to them – they fit in well on the night. Also, the production of the gig was exceptional as ever. Sure, there was a Comedy Store image flashing on the screen when Rectified Spirit came on, and the odd slide malfunctioned, leading to some improv stuff by P-Man, but the sound was fantastic and members of the crew, when they weren’t busy stage diving (twice), made sure everything went off in a timely fashion. Even Blue Frog decided to drop their whole “We’ll charge 340 bucks for a pint of Tuborg because we jolly well can” and behaved themselves with the pricing. What’s up with guys in the men’s bathroom standing around the urinals (not taking a leak – just standing around) discussing who should’ve or shouldn’t have won which award? It’s also odd how many people just go to the loo to wet their hair and admire themselves. 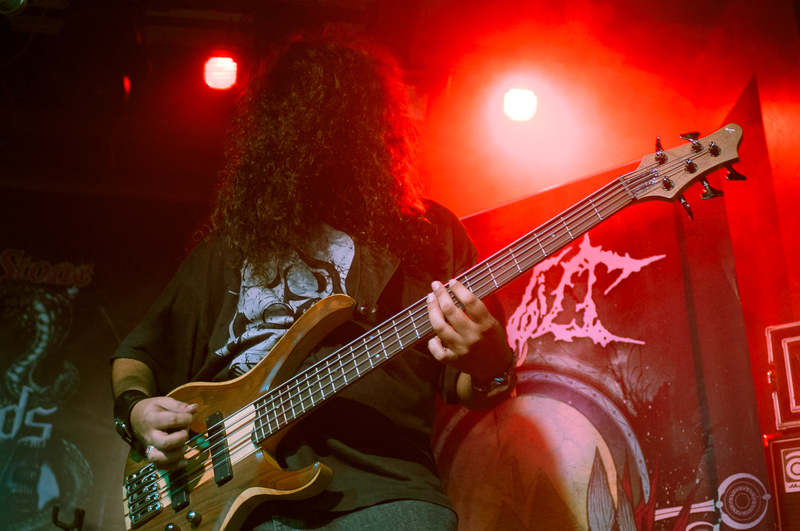 Are we in the age of the metrosexual metalhead? The 1833 AD vocalist seemed to fluctuate with his delivery while talking to the crowd in between songs. He’d finish growling a song, continue growling while chatting with the audience, and then suddenly start talking in his regular voice, then start growl-talking again. The Devoid vocalist, on the other hand, only used his regular voice while chatting with the crowd and only his growling voice during songs. But each song name was announced using his growling voice. The Rectified Spirit vocalist didn’t talk much, while the Scribe vocalist didn’t shut up. What’s the protocol, guys? The 1833 AD vocalist mid-song. 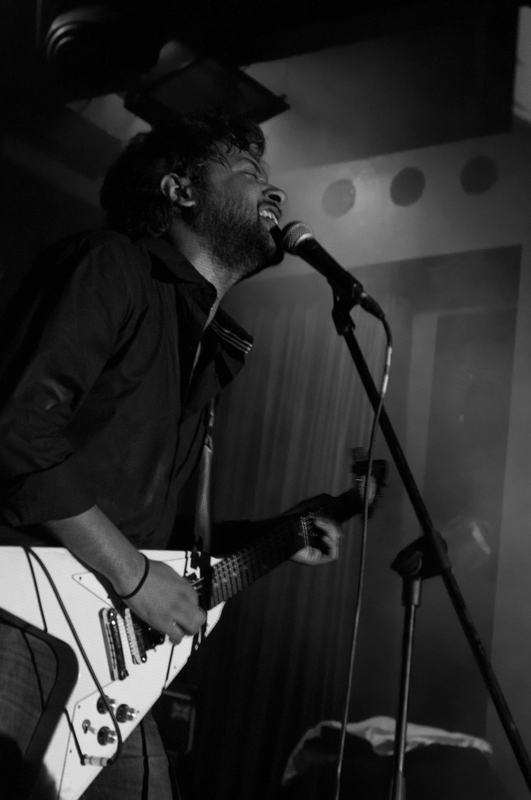 Lovely to hear some of the bands paying their respects to the recently deceased Santhosh Lobo, founder of IndianrockMP3, and the crowd joining in wholeheartedly. It’s a small faux-community with a lot of bitterness and bitchiness but there’s always appreciation and respect for what people do. The Devoid drummer is good beyond description. And according to the grapevine, he doesn’t own his own drum kit. Well, thank god for that because imagine what kind of hell he would let loose if he did. The Devoid bass player knows how to bring the house down. Staying with Scribe, before they took the stage, I asked their guitar-player if he was going to cry on stage since the band was playing in the city after a long, long two years. He said, “No, we’re Scribe, not Cribe.” Zinger. I know the Demonstealer doesn’t want my (or anyone else’s) respect beyond a certain point. What he wants is for people to listen to and like his music and if they like his music then he wants them to buy his music and his merchandise. Nevertheless, full respect to the man for sitting outside in his stall, cool and disaffected, during the entirety of the gig, selling his stuff to fans and politely chatting with them. Once the gig was over, he packed up whatever unsold items he had left, picked up his suit-case, and walked off, his silhouette fading into the sunset. He had mostly his and Demonstealer Records’ bands’ music and merch, but he was also kind enough to stock 1833 AD’s album since they were playing on the night. As an aside, Keshav Dhar (Skyharbor) was last spotted trying desperately not to collapse under the weight of all the trophies he got, which he had to lug around in a giant plastic bag, while little droplets of rain bounced off his enormous forehead. It’s a small thing, but what’s the deal with the bhenchod, madarchod chants? 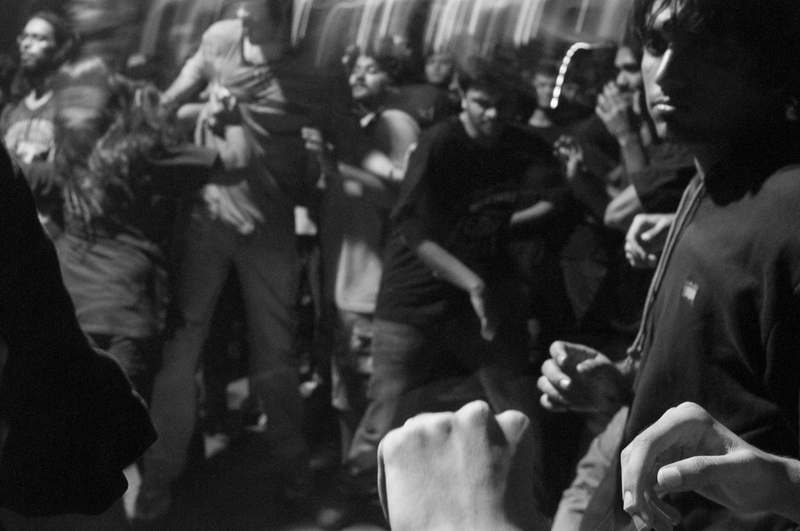 I’m not originally from Bombay, but I do know these chants were initially meant to intimidate bands and voice disapproval at ones that sucked. But now it just seems redundant and self-congratulatory. The crowd on this evening burst into the chant some three times for absolutely no reason, prompting the Scribe vocalist to tutor them on the concept of asking for an encore instead of mindlessly calling bands names. Ultimately, though, the metal awards are a ray of hope and sunshine, especially when placed in contrast to the sham that the rock awards offer. All these awards need is some free whiskey and those appetizers, maybe even a Bollywood B-lister or two in a leather jacket and ripped jeans or something (because that’s what I think they think rock and metal is supposed to be), and we’re all set.